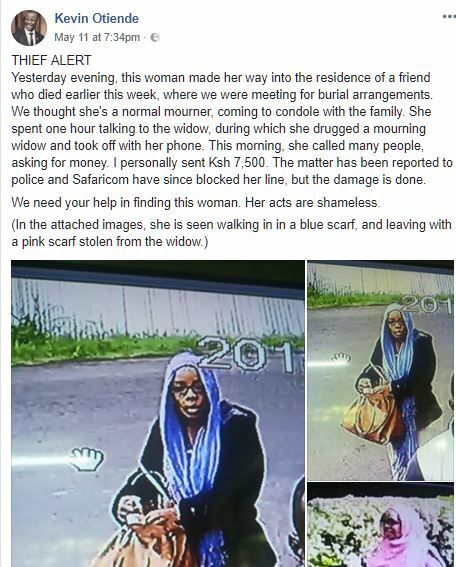 Kasarani Police are said to be looking for a woman who is accused of stealing from mourners during funerals in Nairobi. According to reports, the yet to be identified woman disguises herself as a mourner before drugging unsuspecting victims and making away with their valuables. The suspect’s most recent ‘heist’ is said to have occurred last week Thursday when she allegedly drugged a mourning widow and stole her phone. The incident was shared on Facebook by Kevin Otiende who said the accused used the widow’s stolen phone to solicit money from her friends and relatives. “The woman made her way into the residence of a friend who died earlier this week, where we were meeting for burial arrangements. We thought she’s a normal mourner, coming to condole with the family. She spent one hour talking to the widow, then she drugged her and took off with her phone. According to Otiende, he fell for the con and sent Sh 7500 believing it was the widow. 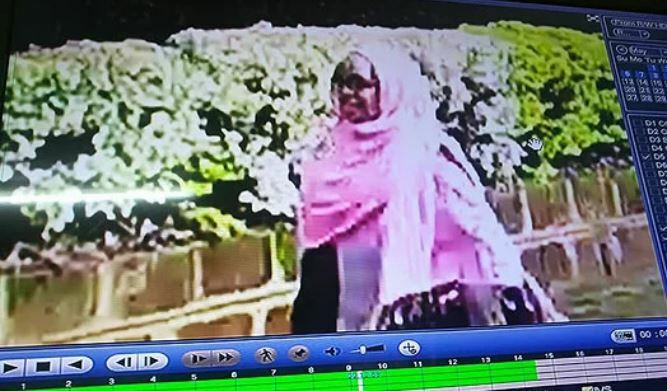 Otiende further shared images of the suspect who was caught on CCTV cameras walking into the widow’s house in a blue scarf and leaving with a pink scarf stolen from the widow. Coincidentally, several social media users identified the woman and accused her of similar robbery incidents, some dating as far back as May 2016. Monica Ngatia added: “This chick is still doing this, no noooooo, she did same to me when my sister passed on, 8 years ago. what name appeared on the mpesa?